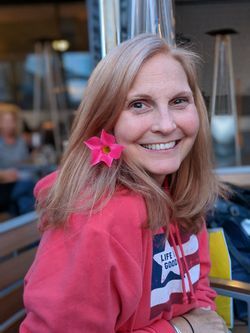 Tyngsborough - Wendy Bonner Holman, age 53, passed away on Saturday afternoon, November 10 after a decade long battle with cancer. She was the wife of Ken Holman, and mother of Brendan, Patrick, and Sidney. Wendy was born as a belated Christmas gift to Ray and Patricia Bonner in Westchester County, New York in 1964. She grew up with her five siblings in Yorktown Heights, where she developed a great love for the outdoors, and for animals. She attended Roger Williams College in Rhode Island, and then moved to Massachusetts to start her career. She and Ken were married in 1995, have lived in Tyngsborough for over 20 years. Wendy was an excellent athlete and played both basketball and volleyball at the collegiate level. She continued to play volleyball in competitive adult leagues, and formed bonds of friendship with her teammates that lasted for decades. She also enjoyed horseback riding since childhood, and was a regular rider of her favorite horse Journey at Crystal Farms stables, in Dunstable. Wendy loved colonial era traditions, and was proud and delighted to live in a house originally built in 1793. Wendy loved Disney above all other vacation destinations, and she and Ken took their children there every year for most of their childhoods. She was highly valued and long term employee of Parexel, where she rose to become the Senior Director of Business Support Services. Wendy is survived by her husband and children as well as her father Ray Bonner of Yorktown Heights NY, her siblings and spouses David and Tova Bonner of Yorktown Heights NY, Bobby and Tess Bonner of Somers NY, Susan and Glenn Saunders of East Greenbush NY, Michael Bonner of Brooklyn NY, and Cindy Bonner of Ravena, New York. To contribute in Wendy's name to the charity with which she has been passionately engaged since her diagnosis, please visit www.acccure.org and follow the donation instructions. HOLMAN - Family and friends are invited to celebrate Wendy's life on Wednesday, Nov. 14 from 4 to 8pm at the J. A. HEALY SONS FUNERAL HOME, 57 N. Main St., Westford. Her funeral will take place on Thursday morning, Nov. 15 from the Funeral Home at 9:30am followed by a graveside service at 11am at Pine Grove Cemetery, Westford. To share your thoughts and memories of Wendy, please click the sign guestbook link.